Works with or without clay – even zero clay formulations. Allows glaze carving and sgraffito without chipping. Allows unlimited layering of glaze or slip coats. Hardens unfired glaze and slip coatings. Does NOT deflocculate and cause curtaining and drips like CMC does. Almost completely burns away, leaving fired glaze or slip unaffected. For brush application, smooths application and hardens the coat like CMC but allows heavier brush loading and thicker coats than CMC. Does not change with age (requires preservative*). No more hard settled glazes, no more powdery glaze coatings, no more peeling glazes. All your suspension and application problems solved! Add 40 grams MAGMA and 4 grams Copper Carbonate (CuCO3)to 8 ounces hot water. Add a little MAGMA gel to your liquid glaze – start with 1 teaspoon of MAGMA gel per pint of glaze. You can always add a more if you need it, but it’s better to err on the side of caution because MAGMA increases the drying time of the glaze. Determine appropriate quantity of MAGMA. Mix MAGMA powder with other dry ingredients. Add preservative* if necessary. Add dry mix to normal amount of water for glaze batch. Glaze will be a little thicker than you are used to. Wait a few hours before sieving. Always glaze the outside surface first when using a glaze with MAGMA or any other additive. * Recommended preservative: If you plan to store glaze mixed with water for more than one week, add Copper Carbonate (CuCO3), 0.04% of total dry batch (0.4g CuCO3 per 1000g dry glaze). The vast majority of glazes will not show any coloration from this small amount of copper, but it will prevent the gum from rotting. Test before mixing a full batch. MAGMA will dramatically thicken any glaze it is added to. Thinning the glaze to a “normal” consistency will cause very thin coats. MAGMA containing glazes must have more viscosity than typical glazes. MAGMA glazes also take more time to “dry” (the water moves into the bisque slower) after dipping or spraying. 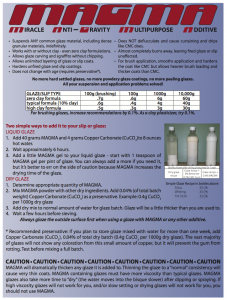 If high viscosity glazes will not work for you, and/or slow setting or drying glazes will not work for you, you should not use MAGMA.